Its flavor is similar to filet mignon and lobster meat. It has low calorie content; it is rich in B vitamins and proteins and helps in reducing serum cholesterol. Have you guessed what we are talking about? 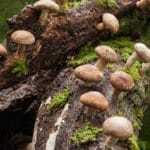 It is Shiitake Mushrooms and we are going to guide you towards growing Shiitake mushrooms. This mushroom called Shiitake is a savory Japanese delicacy and is an emerging star of the gourmet industry.